Far-Right Extremist Laura Loomer Handcuffs Herself To Twitter's Door In Protest Of Her Banning For Assholery - Joe.My.God. Far-right activist Laura Loomer handcuffed herself to Twitter’s New York City headquarters on Thursday afternoon to protest the company’s banning her from the social media platform. Loomer’s account on Twitter was removed a week ago after she posted a tweet criticizing Minnesota Rep.-elect Ilhan Omar, a Democrat, and her Muslim faith, calling Omar “anti Jewish” and pro-Sharia law. 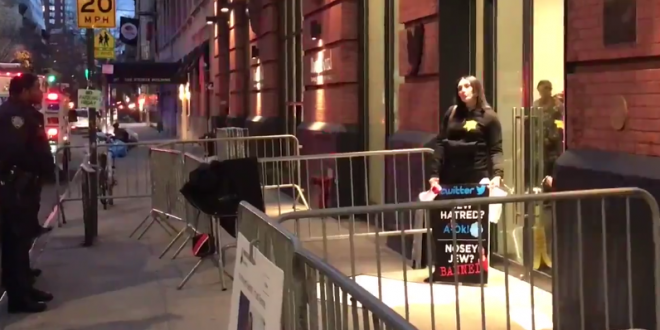 In the incident livestreamed on Periscope, Loomer, wearing a yellow Star of David such as many European Jews were forced to wear during the Holocaust, handcuffed herself to the front of Twitter’s building in Manhattan’s Chelsea neighborhood. I’ve only reported on Loomer’s idiocy a few times here on JMG, but suffice it say that she’s been a part of just about every bit of far-right assholery produced by the Infowars nutbags and the extremists in their orbit.